Allied Foundation Specialists are more than just a team of workers that come to your house to repair your foundation, they are a family. 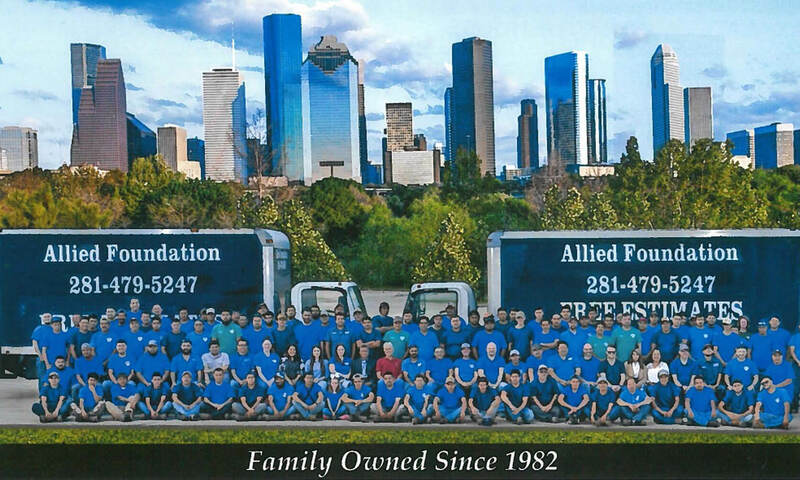 Allied Foundation has been in business since 1982 and has served Houston and surrounding areas providing quality work and excellent service. Most of our services, foundation repair, house leveling, barrier root systems and sewer pipe replacements usually are completed in one day. Allied Foundation has received Awards of Excellence from Angies List® and the Better Business Bureau® by providing impeccable service. We are fully insured and offer a lifetime transferable warranty. We are proud of being a family owned and operated business. The owner started this adventure over 30 years ago and is often seen on many of the jobs watching his team securing homes in the Houston area and thanking customers for the opportunity to provide this service for their families. Whether your home is in Sugarland, Spring, Galveston or Pearland, our family will come to your family. Everyone wants to feel safe and having a secure foundation is just the start. If there's not a problem, I'm going to tell them there's not a problem, or tell them exactly what the problem is rather than just trying to simply sell them the product. It started to rain on them and everything. "They didn't stop working for one minute." "I was truly impressed, and I said now let me call you manager now." "Good service, friendly people." "They do a great job for me." "The prices were good, he made it easier for my clients and we were very pleased." We're just there to educate them on all their options and exactly what's going on with their house. And, I don't, you know, I'm not a pressure guy. I'm there to show you what it's going to take. With me, I think the customer experience is honesty. Whenever I go out to their house, a lot of times I find where they have companies coming out just trying to sell them a product, oversell them a product, and I put myself in their shoes. I've been with Allied for 8 years. It's a good company to work for, good benefits. I've been with the company for 15 years. Good company. Rolling company. What we do we enjoy. You can tell, when we're laughing, and then, you know, we try not to laugh when we pick up the phone, but you know sometimes they can tell when you're in a good mood, most people can. My husband, who grew up with Jason, on the same street, which is one of the salesmen. He knows Jebriska, he knows Richard really well. We're all raising our kids together, you know, and working here, we kind of carry that friendship in here as well. "The foundation wasn't even. I had areas in my foundation that were lower than others. And so my doors weren't fitting right. I had cracks in my walls and things like that, so I knew that until I had that fixed, I couldn't do anything else. I was very happy with them. I mean they got it all done within, I don't remember the hours exactly, but it was within the whole day. It started to rain on them and everything. They didn't stop working for one minute. They were very careful about my plants." "What I liked about Allied Foundation was two things. Number 1: the work was done really fast, in an expedient manner. I didn't have to leave work or be away from my job." "I have a lot of confidence in this company, in their workers. They're very respectful...they work very honestly. They do a great job." "Their prices were good. They worked hard and finished the job fast." "What I liked about Allied Foundation and Richard Pacheco and the staff that works for him, Melanie, Jebriska, and Jason, I've dealt with ever since '95 or since they've been there, and they are very good at coming out and looking at the property, evaluating the situation, and if there's no repairs needed, they tell me that." "Their approach was so professional, and I decided to go with you guy and it has been no regret." As far as the people that work here, they have been here for years. Some of them have been here almost 15 years. And the good thing about it is that they work together as a team, whether they're in the office or out in the field, they seem to have that one purpose and mine is to give the customer the best possible experience.